Soak tamarind and red chili in water for 1/2 hr. Then grind in mixer by adding 1-2 tbsp water. Heat ghee in thick bottom non stick sauce pan. 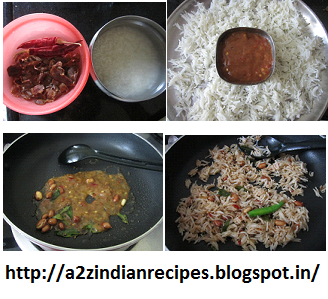 Then add cumin seeds, mustard seeds, pinch of asafoetida, groundnuts and curry leaves. After mustard seeds pops out, add ginger and tamarind paste. Saute for 1-2 minutes. Then add cooked rice and little salt. Mix well. Simmer on low flame for 2-3 min. Serve hot.